Get to know the important elements of one of Japan's culinary gifts to the world so you can ensure that your next order is absolutely satisfying. Not like how most of us were taught about table manners, it is completely acceptable to slurp your noodles in Japan, with incredibly logical reasoning. Firstly, the Japanese believe that slurping will enhance the taste of the noodles by stimulating your appetite. Your slurping is also a mark of respect to the cooks who dedicated their time to making your noodles, signifying that you're enjoying what you're eating. Secondly, because ramen is often served piping hot, slurping allows you to cool your noodles and make it easier to swallow. While it may seem odd at first to slurp your noodles, you'll find it extremely liberating and practical once you start to do so. Just as this writer has joyfully experienced. Before you decide what ramen you want, you have to decide what you're in the mood for. Ramen broths are classified either by assari (light) or kotteri (rich). Funnily enough, while there are many types of broths in the ramen world, four broths rule the roost – shio (salt), shoyu (soy sauce), miso and tonkotsu (pork bone). Light broths, like shio or shoyu, are characterised by thin and clear qualities. They are typically made of animal bones, vegetables or fish and finished with either salt or soy sauce to round out the broth. Heavy soups like miso or tonkotsu, are identified by its thick, creamy texture that usually contain emulsified fats for a full-on flavour experience. While these four broths are the most common types, ramen makers make many other delicious variants, like crab, chicken, mixed seafood and so much more. Ramen restaurants typically serve noodles that complement the soup and vary depending on the soup. 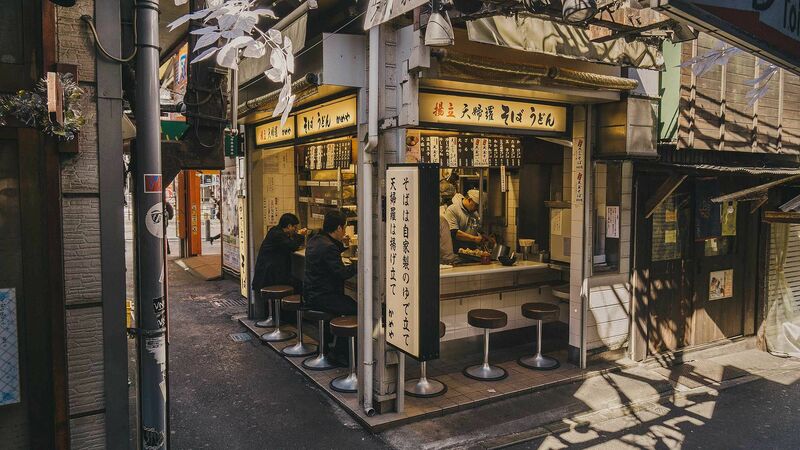 While most ramen noodles comprise of three ingredients: wheat flour, salt and alkaline mineral water, ramen shops make their own fresh noodles to ensure maximum compatibility with their own house blend of broths. Noodles are also divided into hosomen (thin), futsuu (regular) and futomen (thick) sizes, and can be cut to be straight or wavy. For example, creamy thicker broths like tonkotsu are typically paired with thin noodles while wavy noodles are usually served with broths like shio and shoyu. Some ramen restaurants will also ask you how you prefer the doneness of your noodles when ordering, with softer noodles yielding a greater chew while harder noodles give off a smaller bite. Now that you have chosen your ideal broth and how you prefer your noodles, it's time to complete your order with your toppings of choice. Most ramen orders come with three or four toppings, such as chashu (sliced pork), tamago (egg), menma (bamboo shoots), nori (dried seaweed), naruto (white fish cake with a spiral pattern), negi (spring onion) and moyashi (bean sprouts). Most restaurants will offer variations of their signature offerings with more of certain ingredients, like chashu and nori for example. Diners are encouraged to customise their toppings of choice for a perfect bowl, with even side dishes the likes of gyoza and corn being common additional orders to enhance the ramen eating experience. When your order arrives and is placed in front of you, resist the urge to shove your chopsticks in and go for the noodles first, add seasoning or do anything to alter the taste. Instead, taste the soup with a spoon before you do anything else to get the full flavours of the broth and to appreciate the laborious work the restaurant took to make it what it is. However, do remember that when you intend to only drink the soup, put down your chopsticks and use your soup spoon with your right hand. When you go back to noodle eating mode, it's completely acceptable to shift your soup spoon back to your left hand and use your chopsticks in your right. You've tasted the soup, slurped your noodles and ate your toppings. To shake things up a little, diners are free to add spices that can further enhance the flavour of your ramen. Additionally, some ramen restaurants may serve offer the choice of flavoured oils to the mix. Not only do they enhance the flavour of your noodles when eating them, they help to prevent temperature loss due to its insulating nature. From black garlic oil to red pepper oil, be wary that oils can have a dominant flavour that you may or may not find yourself liking. Spices like shichimi (seven spice), yuzukosho (yuzu pepper) and togarashi (chilli powder) are common choices on the table, while additional condiments like sesame seeds, garlic and even butter, which is more common in the nothern parts of Japan, are also valid choices for further customisability.